An agar plate streaked with microorganisms isolated from a deep-water sponge. An agar plate is a sterile Petri dish that contains agar plus nutrients, and is used to culture bacteria or fungi. Generally, 'selecting' substances are also added to the plate, such as antibiotics. It can be helpful to gently boil the mixture to facilitate dissolving: this can be done in a microwave oven, or over a gentle flame. Once dissolved the agar needs to be sterilised, usually by pouring it into a conical (Erlenmeyer) flask, then sealing the top with a cotton wool wad, and finally covering the cotton wool with a loose layer of aluminum foil. This is then autoclaved for 15 minutes. The sterile agar is then allowed to cool to 50 °C: this is just above the setting point of agar and pouring at this cooler temperature helps prevent condensation forming on the lid. Chemical agents (e.g. antibiotics) are added at this step to prevent their degradation at the higher temperatures; agar is especially useful in that it may be sterilized at higher temperatures yet since it solidifies at lower temperatures, chemical additives may be added without fear of degradation. Before the plates are poured, every care is taken not to contaminate them with stray bacteria: sterile technique must be used. Hands are thoroughly washed with antimicrobial soap and hot water. A Bunsen burner is set up with a gentle blue flame. This will be used to sterilise the mouth of the flask, and will also provides a reasonably sterile environment in the vicinity. This will also be used to flame plates that develop bubbles from pouring. The number of plates to be poured are placed on the bench, with their lids still on. The aluminium foil is removed and discarded. The cotton wool is removed with the little finger. It is held in the little finger the whole time, not put down. The mouth of the flask is flamed to kill bacteria on the outside of the rim. The lid of the plate is lifted just high enough to allow the plate to be poured, and the dish is quickly half filled with agar. The lid is replaced, the plate swirled gently to ensure even distribution of the molten agar, then left to stand on the bench for at least 20 minutes to solidify. Once all the plates are poured, the flask mouth is reflamed and the cotton wool reinserted. Any unused agar is still sterile. To allow traceability, a lot number assigned to the flask is written on the plates poured with it. The most common method of inoculating an agar plate is streaking. With this method, a small amount of sample is placed on the side of the agar plate (either with a swab, or as a drop from an inoculating loop if the sample is a liquid). A sterile loop (flamed until red hot, then cooled by touching the agar away from the inoculated sample) is then used to spread the bacteria out in one direction from the initial site of inoculation. This is done by moving the loop from side to side, passing through the initial site. The loop is then sterilised (by flaming) again and the first streaks are then spread out themselves. This is repeated 2-3 times, moving around the agar plate. What should happen is that single bacterial cells get isolated by the streaking, and when the plate is incubated, forming discrete colonies that will have started from just one bacterium each. This pattern is used for culture of urine. A small loop is dipped in the urine, and a single streak is made down the middle of the agar plate. Then the loop is swayed in and out going through the streak multiple times at right-angles to the first streak. A needle is flamed then immersed in the culture. It is then stabbed into a small sterile jar of nutrient agar. If the bacteria are anaerobic they will grow, otherwise they do not. A lawn is often used for testing sensitivity to antibiotics, or for work with bacteriophages. What is needed is an even and complete spread of growth all over the agar plate (a "lawn"). Around an antibiotic disc there will be a clear area in which bacterial growth is inhibited; the diameter of this area can be measured to find out whether that bacterial strain is resistant to the antibiotic. One way to prepare a lawn is to use a 0.5 McFarland suspension of bacteria in saline (this means the saline is made just slightly turbid.) A sterile swab is dipped into this suspension, then it is moved from side to side down the whole agar plate so all the area is covered. 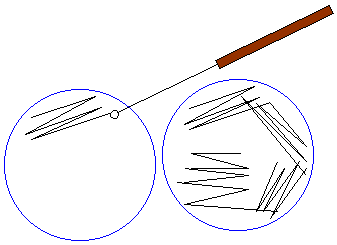 The plate is rotated 90 ° and the swab moved side to side perpedicularly to the first time. This is done once more with the swab rotated 45 °. Once a lawn has been prepared, a small disk of sterile filter paper is soaked in antibiotic and placed on the plate. After incubation there will be a ring of zero growth visible around the filter paper if the lawn bacteria are sensitive to that antibiotic. A collection of small disks each soaked in a different antibiotic, and attached to a larger ring, can be purchased commercially. They are known as antibiotic sensitivity discs or by the name "Mastrings" (a trademark of Mast Group Ltd) and can be used to test the sensitivity of an organism to a range of antibiotics all at once. Plates are incubated upside down to prevent drops of condensation collecting on the inoculated surface. Some plates are incubated at 37° C in a 5% CO2 atmosphere: the temperature and conditions at which some of the body's bacteria will grow. Special incubators can maintain these conditions. Some bacteria must be incubated anaerobically (without any oxygen). These can be placed in containers, along with a substance that removes oxygen, and the tightly sealed container placed in the regular incubator. Fungi, and some bacteria (e.g. Yersinia sp. ), should be incubated slightly cooler. This is usually 30 °C, and room air often is used. Yoghurt bacteria grow at much higher temperatures (typically ~45 °C). They are therefore particulally safe to use when teaching microbiology, especially to children. Campylobacter is a difficult bacterial species to grow. It needs special agar plates, plus its own microaerophilic environment. Blood agar - contains blood cells from an animal (e.g. a sheep). Most bacteria will grow on this medium. Chocolate agar - this contains lysed blood cells, and is used for growing fastidious (fussy) respiratory bacteria. Neomycin agar - contains the antibiotic neomycin. Sabouraud agar - used for fungi. It contains gentamicin and has a low pH that will kill most bacteria. Thayer-Martin agar - chocolate agar designed to isolate Neisseria gonorrhoeae. XLD agar - xylose lysine deoxycholate agar. It is used for the culture of stool samples, and contains two indicators. It is formulated to inhibit Gram-positive bacteria, while the growth of Gram-negative bacilli is encouraged. The colonies of lactose fermenters appear yellow. Nutrient agar - safe to use in school science laboratories because it does not selectively grow pathogenic bacteria. Hay Infusion agar - used for the culturing of slime moulds. MacConkey agar - MacConkey agar is both selective AND differential. The medium is used to differentiate between Gram negative bacteria while inhibiting the growth of Gram positive bacteria. The addition of bile salts and crystal violet to the agar will inhibit the growth of most Gram positive bacteria, making MacConkey agar selective. The medium also differentiates between lactose-fermenters and lactose nonfermenters. Lactose and neutral red are added to differentiate the lactose fermenters, which form pink colonies, from lactose nonfermenters that form clear colonies. Plates, once finished with, must be made safe before throwing away. The usual method is to place inside an autoclave bag and then sterilise by autoclaving at 121 °C, 103 kPa (15 psi) for 15 minutes. Plastic plates will melt (hence the bag). After about 20 minutes the autoclave will have cooled down and the bag can safely be thrown away. If no autoclave is available an ordinary domestic pressure cooker can be used, or, in a hospital or professional lab an incinerator may be used. Other equipment may be decontaminated by being placed in a suitable disinfectant such as Virkon for 24 hours. When all manipulations are done, the bench is disinfected once again. The last step should be to wash the hands thoroughly with antimicrobial soap and hot water before leaving the lab. This page was last edited on 27 February 2019, at 11:45.